Now I am older enough to have read the book from which this phrase has been lifted and it doesn’t really fit however it does make a great headline. The cynical side of me would suspect that this was leaked by No. 10 to try and scare MPs into voting for Theresa May’s dea. If this was the case then it really underlines just how weak she is and just how far we have descended down the rabbit hole. We are now in a position where there is no mechanism to get rid of the Prime Minister for the next 12 months: I don’t believe that even if Jeremy Corbyn got his general election he would come anywhere close to the numbers need to forming a stable government and I doubt whether Labour will get more seats than the Conservatives – that is just how crazy the world is at the moment). So we are stuck with the crumbling May government because the Conservatives can’t remove her for another 12 months – nice one Jacob. 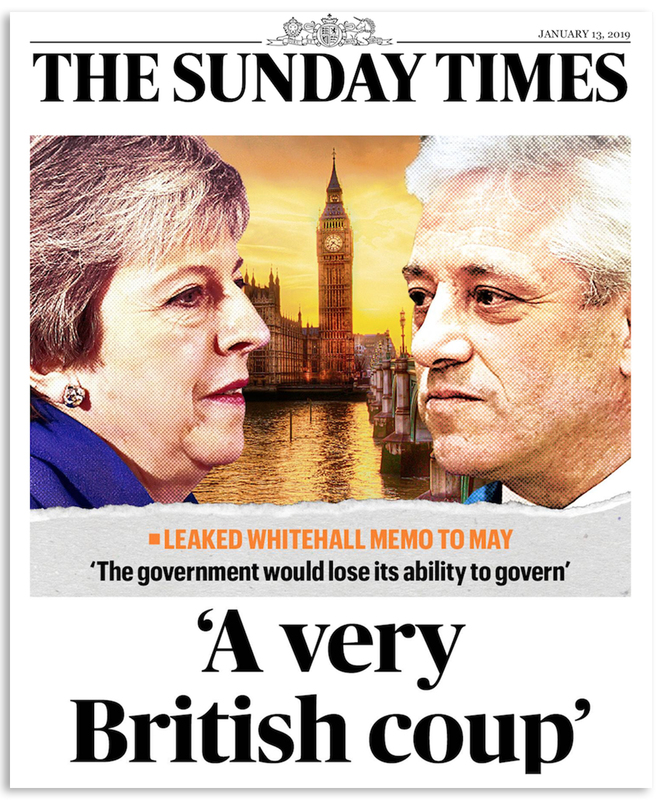 The other person on the front page is the Speaker of the House John Bercow who is now being seen as threat to the Government. This is incorrect. The only reason that John Bercow has any real influence on any of this is because Theresa May threw her slender majority away in a pointless General Election in 2017. To be fair to her everyone thought she would greatly increase the majority and it did take a special kind of political talent to turn all the predictions on their head and lose your majority. Welcome to Theresa May’s unique skill set. Now I don’t want Brexit but also I don’t want the turmoil that will follow should any attempt be made to delay or stop Brexit. What is quickly forgotten is that one person died because of the last referendum and denying the clear will of the people will open even wider the wounds caused by this damned process and goodness only knows what will come seeping out. We voted to leave the EU in 2016. Both of the main parties, who got over 80% of the votes in the 2017 General Election, ran with manifestoes that said they would honour the result of the referendum. I can’t think of any clearer way to judge what the British public want. I don’t think leaving the EU is the best for the country but nonetheless we should do so and we should do it on the 29th March 2019. We then have to deal with the world we find ourselves in on the 30th March – whether it is suboptimal or not only time will tell. When you ask the people their views you have to accept the result – after all it is their country as much as the people who work in and around the Palace of Westminster. 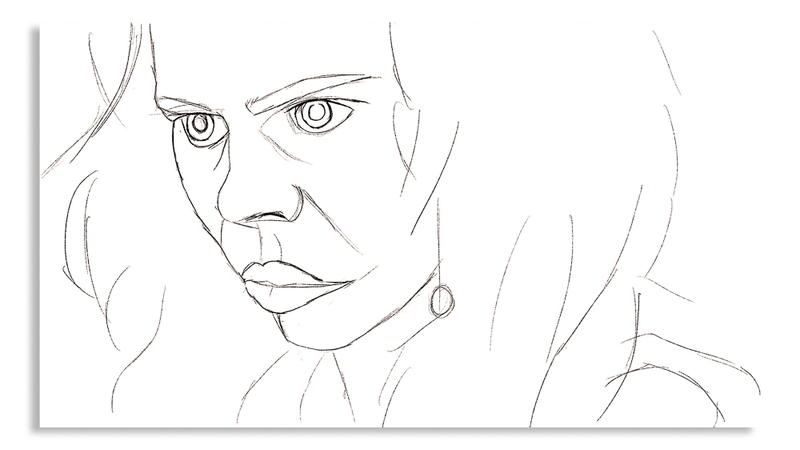 Finally, on a much brighter note I have decided it is time to make a new digital painting if you no other reason that it gets my mind away from the lunacy above. It was also driven by examining the battery percentage usage over the last 10 days – I hadn’t made anything using my Apple Pencil. That will change – hence the new painting and strange coming together of hard facts and creative talents. Exactly everything that Brexit isn’t! This entry was posted in Apple Pencil, Art, Brexit, Conservative Party, Digital Painting, European Referendum, General Election 2017, Labour Party, Politics and tagged Apple Pencil, Brexit, Digital Painting, European Referendum, Jeremy Corbyn, Jo Cox, Procreate, sketch, The Sunday Times, Theresa May, woman. Bookmark the permalink.